Browsing 36 posts in Uncategorized. Your brain is an amazing organ. Not only does it automatically control much of what your body does all day, every day…it manages a huge number of sensory inputs. From your toes to the top of your head, your skin is a giant sensory organ sending your brain constant signals about temperature, pressure and sometimes pain. Your ears are constantly sending your brain input from all the sounds happening around you. Your eyes are like two incredible HD cameras sending ridiculous amounts of visual data that your brain has to assemble into the things you see at any given moment. In short…your brain has a lot to do. In order to make that possible, your brain has to learn some short cuts. 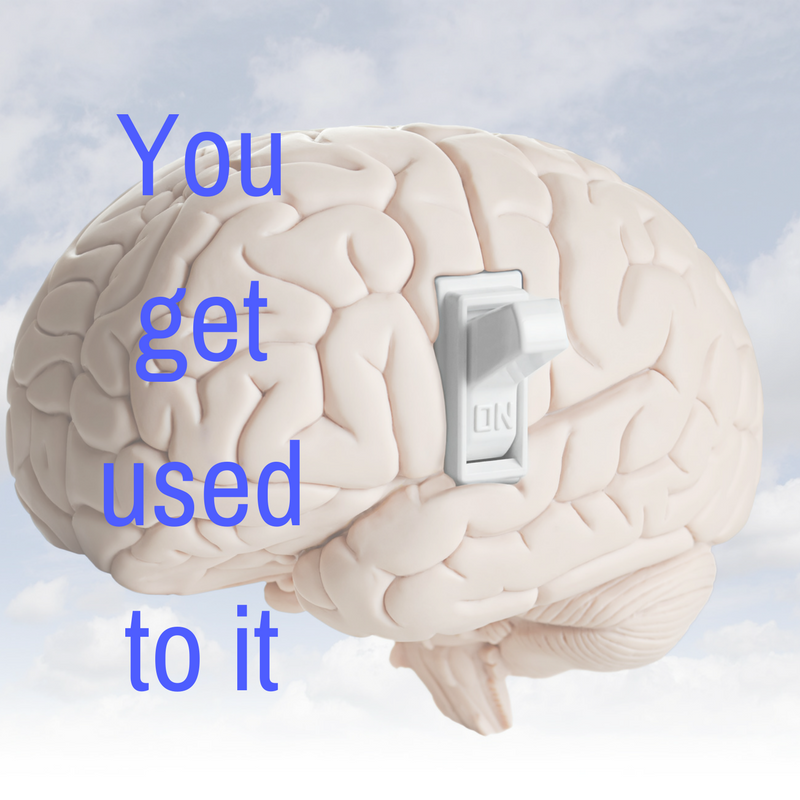 Let’s be honest…all of the input your brain gets isn’t important. Brains are used to making decisions about survival. It’s definitely more important to notice the tiger jumping out from behind that tree than it is to remember that the car that just passed you a few miles back was blue. So the brain is pretty good at filtering out the stuff that’s less important. Take for example the town where my mother grew up. It was outside a large chemical plant. When I would visit my grandparents the first thing I would notice was a distinct and strong “chemical” smell. It wasn’t exactly unpleasant, but it was very noticeable. It usually only took a few minutes before I didn’t notice the smell any more. My brain decided the distinct smell wasn’t a threat and it pushed the mute button. I just didn’t notice it after that. Brains need to be able to do this because the amount of stimulus that reaches the brain at any given moment would be otherwise unbearable! And then you remember that yeah, now that you think of it, when you eat things like roast beef or anything stringy they always get stuck in the same spot. And wait a minute…a piece of that tooth not the lower right did kind of chip off, but it doesn’t hurt. In fact, I forgot about it. Remember that crazy brain you have? The one that can tune out the way your dog smells after it got sprayed by a skunk? It realized that your survival wasn’t threatened by that obnoxious roast beef catcher between your lower molars, so it tuned that sucker out. A partially broken tooth. Just one of the many problems you could get used to and not even realize! So definitely trust your brain when you’re hiking through the African savannah or crossing the street. But maybe trust your dentist a bit more about the condition of your teeth. Because it’s possible you’ve gotten used to something that could cause you pain or problems down the road! Did this make you rub your teeth with your tongue? Did it make you want to slide underneath one of our microscopes so we can get a closer look? I’d love to hear about it! You can share any Mead Family Dental post with a “Like” on Facebook, a “+1″ on Google+ or you can even “Tweet” it with Twitter! All you need to do is hover over the heart shaped button next to the title of the post. Or you can leave a comment by clicking on the balloon shaped icon next to the title. I recommend a crown or an onlay to lots of my patients. 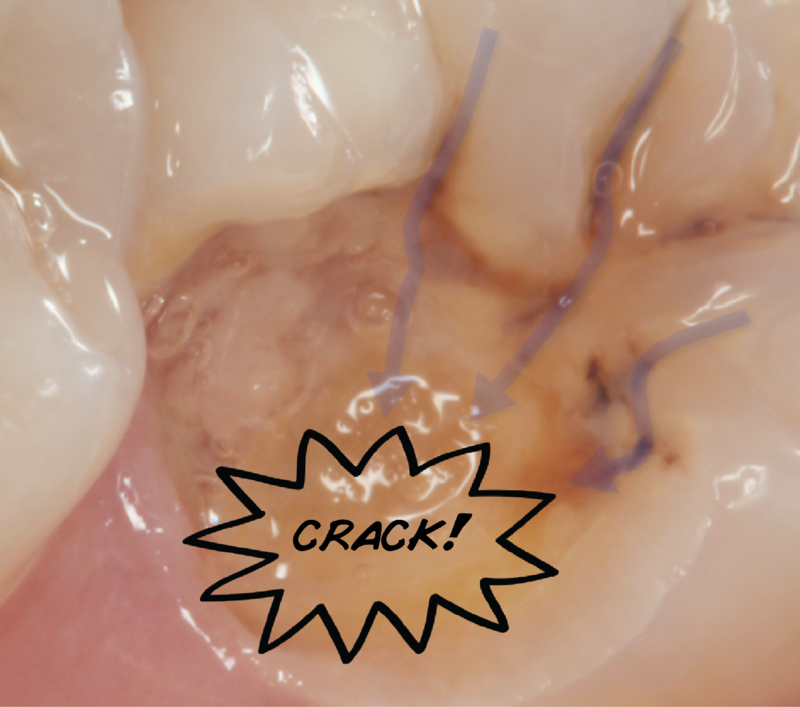 It’s one of the most common procedures we do and we do it very well if I say so myself. A crown is created by a lab and cemented over top of a patient’s existing tooth structure to restore form and function and to reinforce that patient’s tooth. They’re very predictable and work really well. “How much does this wonderful service cost?” you might ask. The answer is going to vary by geography but it’s typical for a crown to cost around $1000. A little less in some place, a lot more in others. I hear you. $1000 is a lot of money. Who wouldn’t want to spend it on something else. Something fun like a phone, some shoes, a trip or whatever. But let’s take a look at that $1000. Our office charges slightly less than that $1000, but the math is easier with $1000. 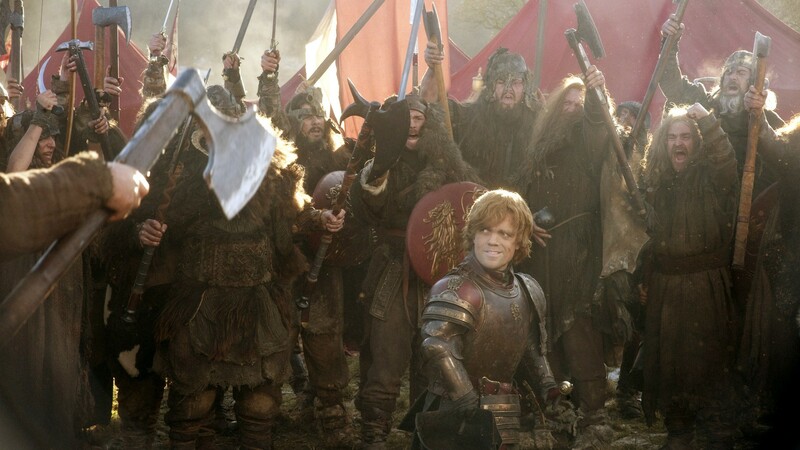 Most dental benefits companies will replace a crown after it’s been in the mouth 5 years. That is not typical, though. 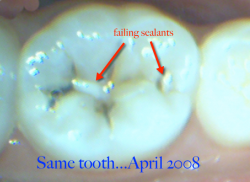 My experience tells me that crowns typically last 15 years or more if the patient has good oral hygiene, good saliva flow and has risk factors like dry mouth and high decay rate under control. Lets take 15 years as a reasonable lifespan for a crown. Now be honest…what other things do you own that have lasted for 15 years? Is your car 15 years old? How about your phone? Your shoes? Bottom line, there’s almost nothing that you spend money on (sometimes a LOT of money on) that lasts as long as dentistry does in a healthy mouth. 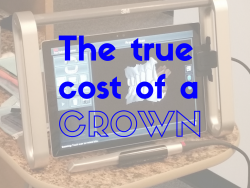 A $1000 crown costs you $1000 on the day that you pay for it (or less if you are using a dental benefit…your mileage may vary). If that crown lasts for 15 years, you’ve amortized your investment in that crown to $66.66 per year. So for $67 you’ve got a beautiful and functional tooth that you probably don’t have to give another thought. Is $67/year a little too abstract for you? How about this. You’re talking about $5.55/month over 15 years for that crown. One less latte from Starbucks will give you pain-free beauty and function. OK…let’s get stupid here. 18 cents per day. That crown is three nickels and three pennies per day for 15 years of chewing, smiling and not thinking about it. I’d say it’s worth it in spades. It actually gets better, though. I’ve seen crowns last longer than 15 years. If you’re really good about taking care of your teeth and watching your diet there is no reason a crown cannot last longer. I’m not going to pretend that ever crown is problem free. To be honest, if we’re trying to restore a particularly broken down tooth, it’s tougher to get that predictability and longevity. Furthermore, some teeth require root canal treatment (again…the more beat up the tooth, the more likely this is). So I don’t want to oversimplify. The point is to look beyond the price tag that you see in the office and think of the cost over the life of the crown. These restorations feel expensive on the front end, but if you look at the long run they’re a pretty great bet! Did this make you feel thrifty? 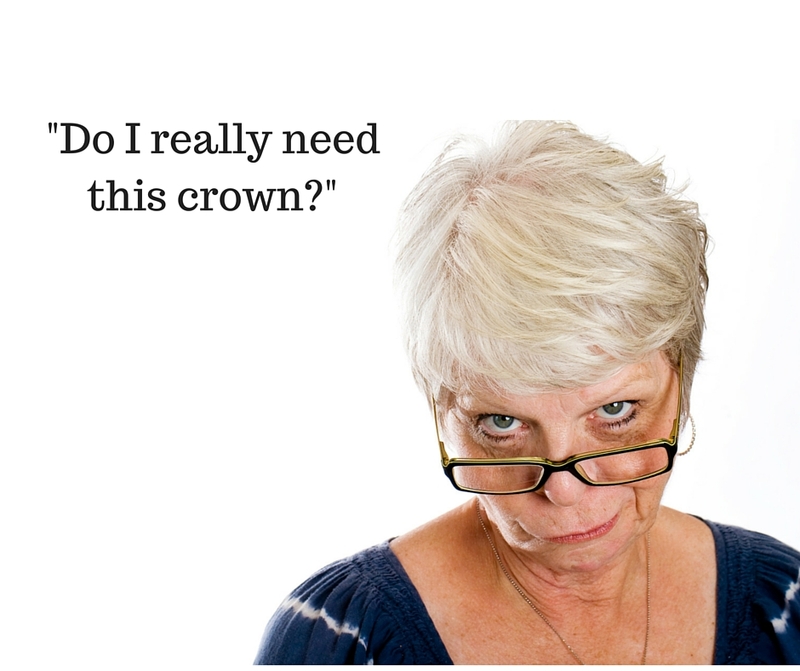 Did it make you want to invest in a new crown? I’d love to hear about it! You can share any Mead Family Dental post with a “Like” on Facebook, a “+1″ on Google+ or you can even “Tweet” it with Twitter! All you need to do is hover over the heart shaped button next to the title of the post. Or you can leave a comment by clicking on the balloon shaped icon next to the title. Choose dental health. It’s much cheaper. I recently had a patient cancel her appointment at the last minute. This happens sometimes. It’s frustrating for a dentist or hygienist when we’ve set time aside for a patient and they don’t come. Usually there’s a good reason. In this case, no reason was given. As I sometimes do…I took it personally. Why did this person choose not to have the treatment done that we discussed? What could I have done better? This particular patient has been coming to our office for years. She is someone you might describe as “skeptical” of dental treatment. I suspect she had some bad dental experiences before I even came into the picture. She’s at least mildly phobic of dental treatment, too. However, I think she’s probably one of those people that believe that when I come in the room that I’m simply looking for work to do, probably to line my pockets. It’s a difficult spot for a dentist. Often times we’re both the internist that diagnoses the problem and the surgeon that fixes it. Patient see this as a conflict of interest. The guy who is telling me that I have cavities is also the guy who benefits from them being fixed. I completely understand this. I take my role as a doctor very seriously and I put my patient’s needs first. But can you blame a patient for being skeptical of a doctor’s motivations? When I examine a patient I’m looking to see what level of dental health the patient has. And when I see a problem, I’m obliged to tell them about it. I have found what I believe is the most effective way to do this. I do all of my recall exams with a dental operating microscope. This microscope magnifies what I can see and has a very bright light that allows me to see parts of the mouth that don’t get lit up very often. I’ve attached an HD camera to the microscope with a monitor mounted over the patient to allow them to see exactly what I’m seeing…as I see it. I feel like this is a great solution to the problem of showing the patient what I see instead of me just describing it. I like it more than still photos because I can show it to them “live” as I’m describing it. Back to my patient that chose not to come in today. I definitely examined her with the microscope and I definitely showed her what I was seeing. I recommended to some treatment because I saw some problems. I try and do this dispassionately. I try not to “sell” a patient on treatment by showing them what I’m seeing. I try to help the patient choose dental health by showing them what I’m seeing and describing what we can do to correct dental problems. I have a suspicion that this patient still thinks what I’m describing isn’t a real problem. Like many dental problems, what I’m describing probably doesn’t hurt. Most cavities don’t hurt. Gum disease almost never hurts. Even broken teeth often aren’t painful. If you use pain as the threshold for dental treatment, you’re probably going to end up choosing the most expensive way to fix the problem or worse, sometimes the problem can’t be fixed leading to the loss of a tooth. 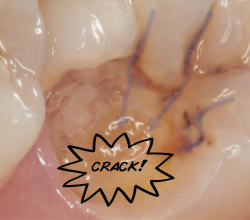 A small cavity left untreated almost always becomes a bigger cavity, so what may have been easy to fix with a filling could end up needing a crown or even a root canal. This sounds like a scare tactic used by a dentist. Ask any dentist and they’ll explain that they see it. All. The. Time. So I’m going to suggest that you listen to your dentist’s recommendation. The choice to treat is always yours. But almost always, the sooner you treat a problem, the less expensive and potentially painful the fix is. 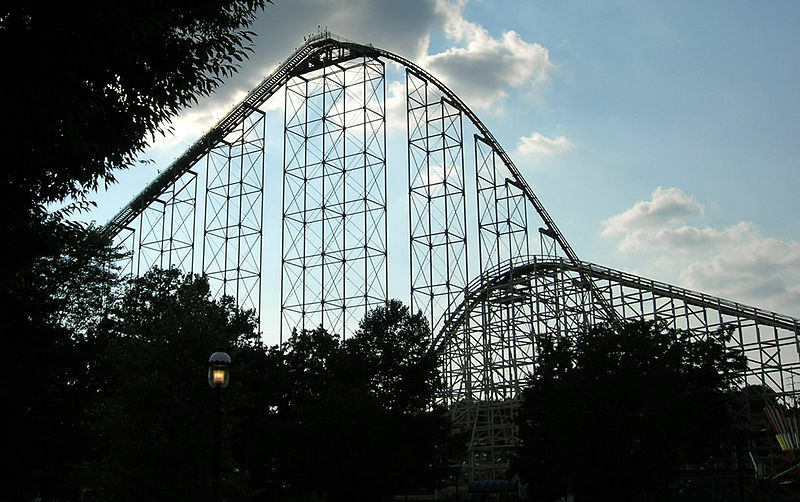 Did this make you feel skeptical? Are you feeling put under the microscope? I’d love to hear about it! You can share any Mead Family Dental post with a “Like” on Facebook, a “+1″ on Google+ or you can even “Tweet” it with Twitter! All you need to do is hover over the heart shaped button next to the title of the post. Or you can leave a comment by clicking on the balloon shaped icon next to the title. 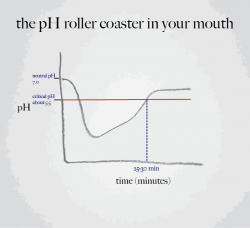 If you spend any time on Facebook, you’ve probably seen articles on oil pulling. The “ancient” practice involves swishing coconut or sesame oil in your mouth and through your teeth to increase your oral health. Not only is it claimed to be better than conventional oral hygiene, but many also claim numerous other benefits. So, should you use this technique for better health? Here are three reasons you should skip oil pulling. It doesn’t do what they claim it does: One of my pet peeves is when alternative medicine proponents claim that a certain treatment can detoxify the body. If a treatment is meant to remove toxins, I think it’s important to specify what toxins are being removed. This is where much alternative medicine loses credibility. They convince otherwise healthy people that the environment around them is slowly poisoning them with toxins, but they don’t specify what toxins. In most cases, they don’t even use the term toxin correctly. A toxin is “…is a poisonous substance produced within living cells or organisms; synthetic substances created by artificial processes are thus excluded.” Simply stated, a toxin is a biologically produced poison. Sometimes they’ll mention “heavy metals” or “chemicals.” Typically they insinuate that modern industry and technology is to blame for these toxins in our environment, but rarely do they get more specific than that. But let’s be honest, if you really needed toxins removed from your body wouldn’t you want to know exactly what toxins you have, how they got there and how a doctor is going to get them out? Rinsing your mouth with oil doesn’t remove toxins. At the most, the swishing action might mechanically remove some dental plaque. There is some research that is suggestive that oil pulling can have an effect on bad breath and bacteria that cause tooth decay. However, the research is done on extremely small sample sizes with questionable experimental design. If there is an effect, it is likely from the mechanical effect of swishing the oil. Other liquids would likely have a similar effect. 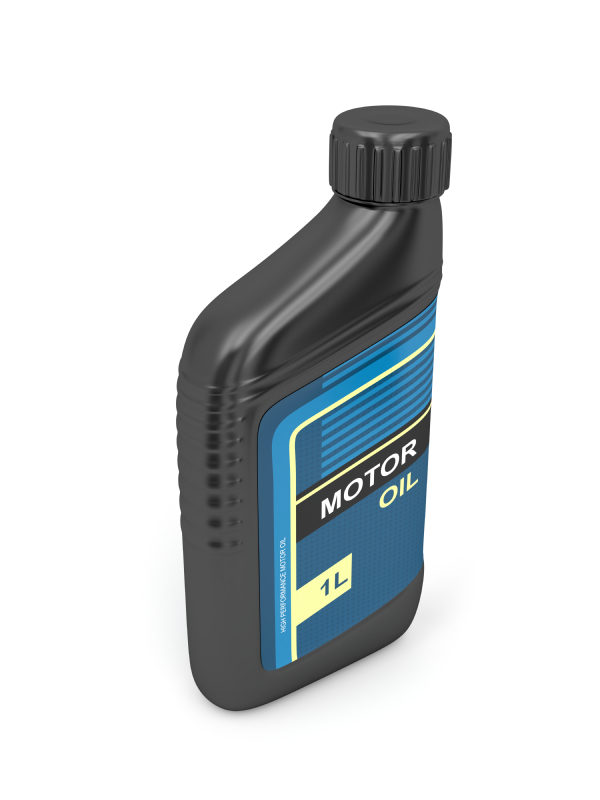 If coconut oil or sesame oil are good, wouldn’t a nice 5w30 motor oil be even better? If it did work, it takes too long: Almost all of the proponents of oil pulling suggest 20 minutes of swishing oil around the mouth is required for the benefit. They’re actually quite specific about the 20 minutes…no more or no less. I don’t know about you, but 20 minutes is a long time to add to my normal routine. Brushing shouldn’t take more than 2 minutes. If you’re going to floss, there’s another two. If you choose to pass on oil pulling, I just saved you 16 minutes per day! 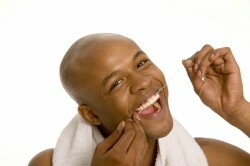 And proper brushing and flossing is clearly more effective at cleaning your teeth and gums than swishing oil around. It’s true that I don’t make any claims of detoxifying your body with regular brushing and flossing, but oil pulling doesn’t really do that anyhow. No harm, no foul. It isn’t risk free: Maybe you still aren’t convinced. You’re thinking, “sure, brushing and flossing is better and I might not be detoxifying my body, but what harm can it do?” There’s this thing called lipoid pneumonia. It’s a special kind of pneumonia that only occurs when someone inhales small amounts of aerosolized oil. Kind of like when you’re swishing coconut oil around in your mouth for 20 minutes at a time. 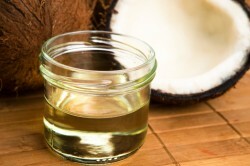 Am I saying that oil pulling will give you lipoid pneumonia? Yes. Yes I am. O.K., I’m not really. I’m just saying that there is a risk of side effects that many alternative medicine proponents fail to mention. 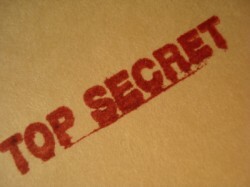 Critical thinking techniques are vital to finding health information on the internet. The best bet is to have a relationship to a trusted dentist and physician. Ask them questions! Answering your health concerns is what they should do best! Did you find this post oily? Perhaps a bit swishy? This dentist in Saginaw, MI would love to hear about it! You can share any Mead Family Dental post with a “Like” on Facebook, a “+1″ on Google+ or you can even “Tweet” it with Twitter! All you need to do is hover over the heart shaped button next to the title of the post. Or you can leave a comment by clicking on the balloon shaped icon next to the title. I’ve heard this before. A lot, actually. Usually after I’ve shown a patient a photo of one of their teeth that is in trouble. Most times the patient understands my concern at this point in the conversation. We’ve probably just reviewed the digital photos that April and I took and beamed over to the iPad. They say that a picture is worth a thousand words, and a high resolution photo of a tooth in trouble usually brings the problem home like nothing else. 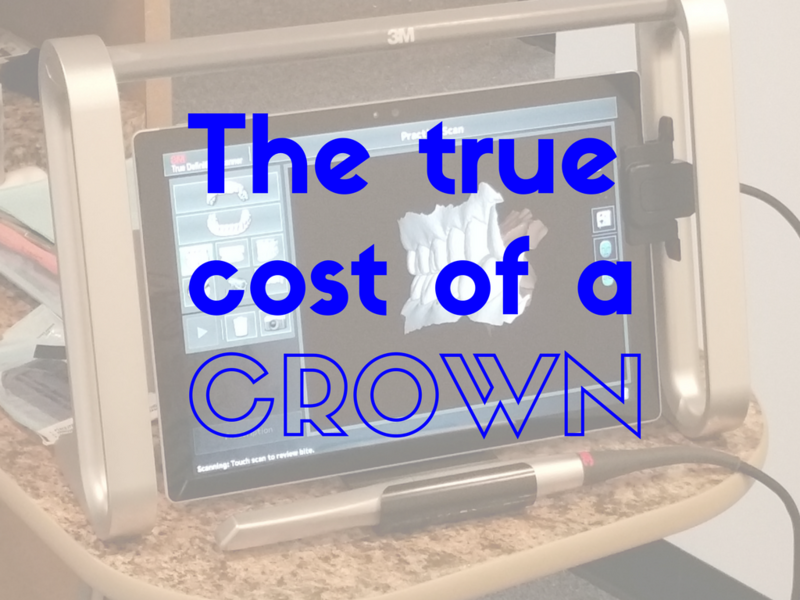 I’ve recommended a crown that costs just under $1000 and it’s not in the patient’s budget. So what are the options? Sometimes, we can get away with doing nothing for a little while. The teeth often aren’t causing the patient discomfort but often there are signs of tooth decay that can be seen, either with my eyes or when I review x-rays. Doing nothing means we may be letting an active decay situation get worse. 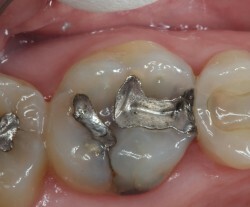 If a tooth could use a crown or an onlay and the patient can’t afford to do it right away, there is often another option. It’s a kind of middle ground between doing nothing and placing a crown. 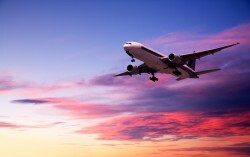 Imagine you’re a pilot of a jet liner flying across the country toward Detroit Metro airport. It’s late January. You’ve been following the weather forecasts since you left Los Angeles and it looks like southeastern Michigan is getting some snow. You know that you and the other planes heading toward Detroit are going to have to land sometime soon, but you also know that the snow causes delays while they make the runway safe. So what are you going to do? The control tower radios in that they’re putting you in a “holding pattern.” This means that all the planes that need to land at DTW are given flight instructions that keep them close and ready to land, but keep them safely away from other planes. So although they can’t land now, they are in a stable flight pattern and they’re ready to land once the runway is clear. That sounds a bit like what we need for our tooth in trouble. We know that we can’t do our preferred treatment right now, but we need our tooth to be stable and ready for treatment when the time is right. 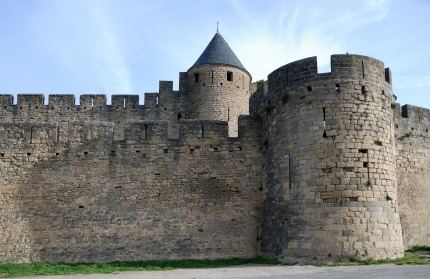 What we really need is a dental “holding pattern.” Is there such a thing? Absolutely! 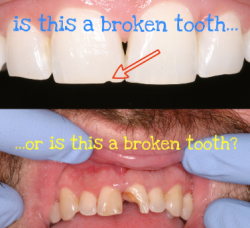 In most cases we can remove failing restorations, take out existing decay and place a bonded core buildup that will last for a couple of years, if necessary. It’s not a replacement for our definitive treatment, because this core restoration isn’t as structurally sound as covering the tooth. However, it can often last long enough to allow the patient to scrape up the resources to take care of the tooth. Is there a down side? Actually, there is. First, you’re going to add about 25% in cost to the overall treatment. A core restoration used as a “holding pattern” is less expensive than a crown, but it does add a few hundred dollars to the complete treatment cost. Furthermore, the less times you need to operate on a given tooth, the better. By placing a holding pattern restoration and then going in to make the final crown, you’re operating on the tooth twice instead of once. There is a risk of damage to the pulp of the tooth whenever we operate, so it’s definitely something to think about. At Mead Family Dental we strive to give our patients the options they need to keep their teeth as well as their budget happy! This Saginaw dentist understands that life is often about compromise, so we offer ways to help sick teeth even when finances are a problem. Most times, we can put a tooth in trouble in a holding pattern so it’s ready for more definitive treatment when we’re able! Did you find this post loopy? Did it make you take off and spread your wings? I’d love to hear about it! You can share any Mead Family Dental post with a “Like” on Facebook, a “+1″ on Google+ or you can even “Tweet” it with Twitter! All you need to do is hover over the heart shaped button next to the title of the post. Or you can leave a comment by clicking on the balloon shaped icon next to the title. Just a little over a week ago I spent my last day in the dental office that I’ve worked in for more than 15 years. In some ways, it felt just like any other day. But when I stopped to think about it, the day had a certain surreal quality. To the best of my knowledge, my “old” office at 3240 Christy Way in Saginaw Township has been a dental office for more than 40 years. Dr. Robert Minnich opened his practice there in 1972 and I purchased the practice from him in 1998. I’ve been working in that office for more than 15 years. I finished moving out of that office two days ago. I did the final vacuum and once-over while the rest of the team was working hard trying to get the new office ready to go for our big opening in a couple of days. 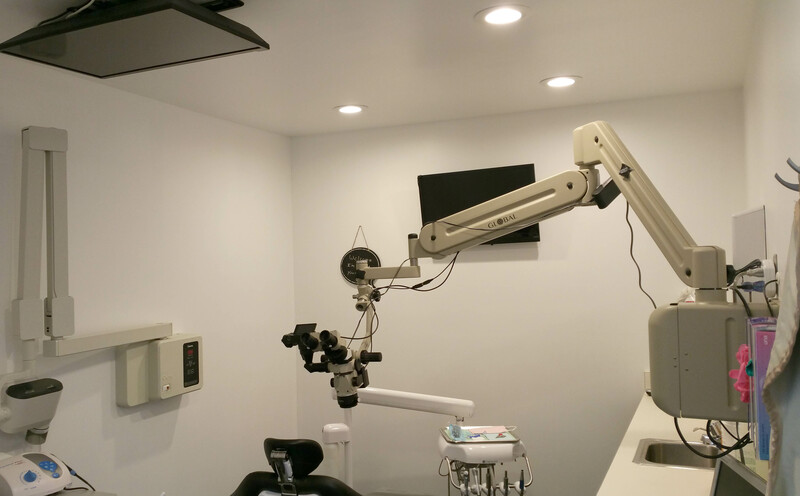 I spent a little time thinking about my first 15 years in Saginaw and came to realize that the first office was an excellent laboratory for me to realize how I liked to practice dentistry. These were my caterpillar years. I learned a lot of things about how to be a dentist and what I would do differently if I could. 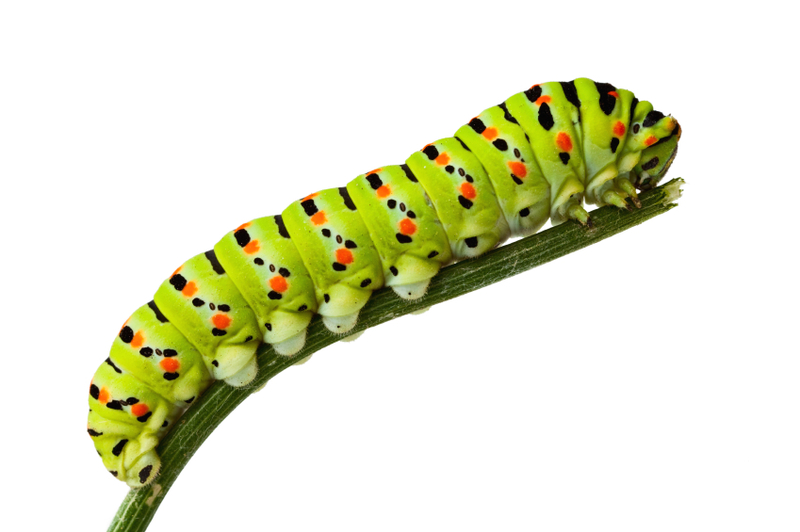 These were good caterpillar years. 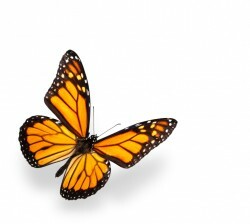 They helped me to decide what kind of butterfly I wanted to build. And we built it! 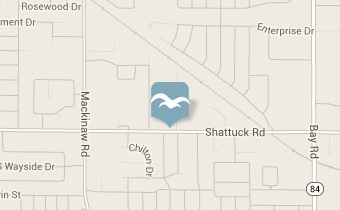 As of September 3rd, 2013 Mead Family Dental will reopen at 3630 Shattuck Road in Saginaw Township. As always we’re taking new patients. And as always we’re performing remarkable, high tech dentistry for real people with care and kindness. But now we’re in a facility that’s unique and interesting, just like our practice! I’d like to welcome back our amazing existing patients and invite anyone else who’s looking for a dentist in Saginaw, MI to take a look. We’d love to have you! If you’ve ever spent any time in a dentist’s office you know they’re always wanting you to come back. “Let’s make another appointment for a filling” or “we’d like to make an appointment for your 6 month cleaning!” They must think you’re made out of money or something. Who’s got time for that? It’s like they think you don’t have a life to live or something. Here are 4 simple tooth care tricks guaranteed to make it so you need to see the dentist less! Drop the pop: If you wanted to design a perfect food to cause tooth decay, then pop would be it. Soda is a perfect storm of fizzy acid in the drink and sugar that bacteria in your mouth can turn into acid. Whether you call it “pop,” “soda” or “Coke”, one thing is for sure: regular drinkers of the stuff get cavities. It’s as simple as that. If you regularly drink a lot of pop (2 or more cans a day, or even a single can over a period of time) you’ll probably get cavities. And cavities mean expensive visits to the dentist. Dentists aren’t the only thing that fix cavities: Dentists want you to think that they’re the only ones who fix cavities. But that’s just plain wrong. 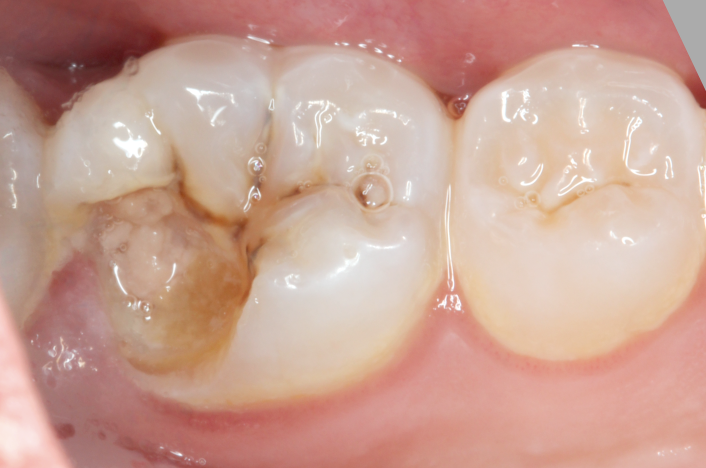 The cavities that a dentist sees don’t start out as huge craters in your teeth. 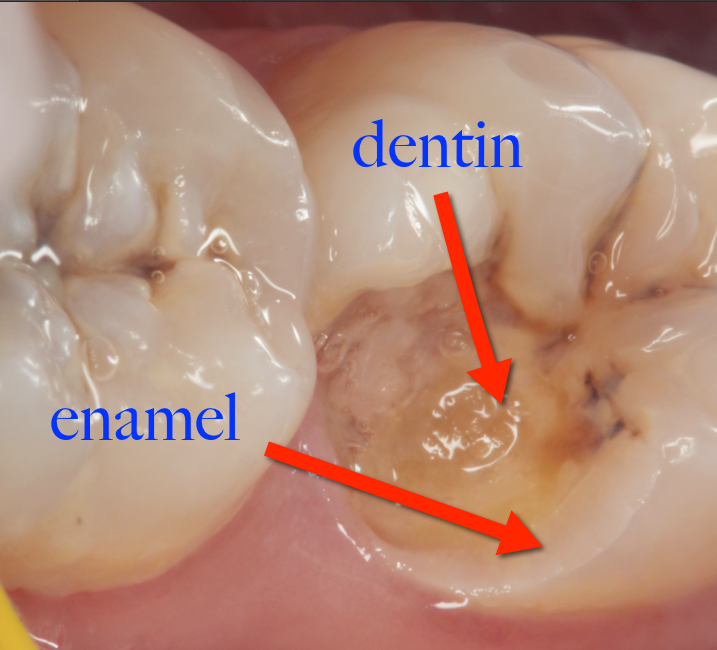 They start out as teeny tiny spots of decalcification on the surface of your enamel. These tiny spots can fix themselves if you have a) healthy saliva flow and b) regular exposure to fluoride. This means regular brushing with a fluoride toothpaste or night time “swish and spit” with a fluoride rinse. “Wait a minute,” you’re thinking. “So you’re saying that I can heal my own cavities?” Yes. You can heal your own cavities. Provided that the cavities are small enough and you have a healthy flow of saliva. 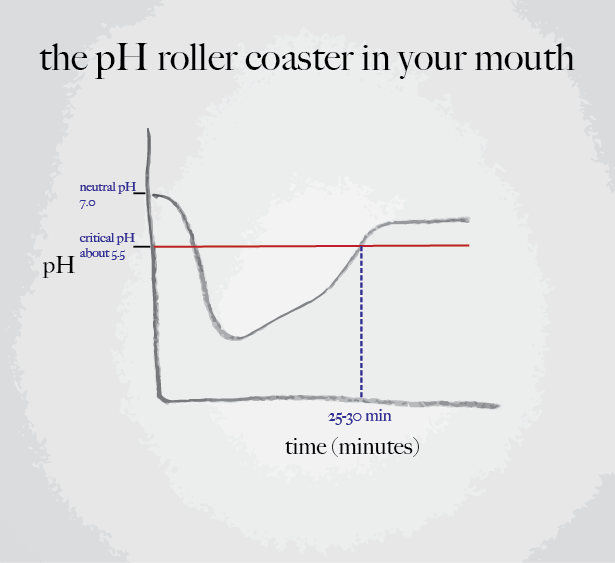 It also helps if your saliva isn’t filled with acid from your diet. Remember the soda thing from above? Who gets gum disease? : This is a complicated question with a pretty simple answer. Smokers get gum disease. It’s probably the most significant risk factor. There are other risk factors for gum disease which include how well you take care of your teeth, what specific bacteria are present in your mouth and your particular immune system. But when you look at people that get referred to periodontal specialists you’ll see a great majority of them are smokers. So if you don’t smoke, don’t start. If you do smoke, you’re probably going to suffer from gum disease if you don’t already. And that means a lot more face time at your dentist’s office. Strings attached: So pop drinkers and smokers are much more likely to need to see the dentist…are there people who are much less likely to see them? The answer is an emphatic “yes!” People who floss daily don’t have as many dental problems as people who don’t. Because people who floss regularly are removing bacterial plaque and food debris (YUM!) from a much greater surface area than brushing alone. This reduces the risk for tooth decay and gum disease and it also makes you feel good about yourself. Actually, it makes you feel like you’re better than people who don’t floss, which makes you feel good about yourself. True story. So there you have it. 4 simple tooth care tricks that will keep you out of the dentist’s chair. You’ll notice that I didn’t say 4 easy tooth care tricks. I said simple, which is distinctly different than easy. It’s hard to break addictions like smoking and pop drinking, but I can promise you it’s very worthwhile! Developing regular brushing and flossing habits is tough, too. But if you can make the effort, you’ll definitely spend less money and less time in your dentist’s office. I did tell one little lie, though. Dentists really do want you to know this. It’s just that whenever the headline says, “tricks that they don’t want you to know about” then people read it. So…sorry for the lie. But not really. Did you find this post sarcastic? Did it make you feel a little tricky? This dentist in Saginaw, MI would love to hear about it! You can share any Mead Family Dental post with a “Like” on Facebook, a “+1″ on Google+ or you can even “Tweet” it with Twitter! All you need to do is hover over the heart shaped button next to the title of the post. Or you can leave a comment by clicking on the balloon shaped icon next to the title.